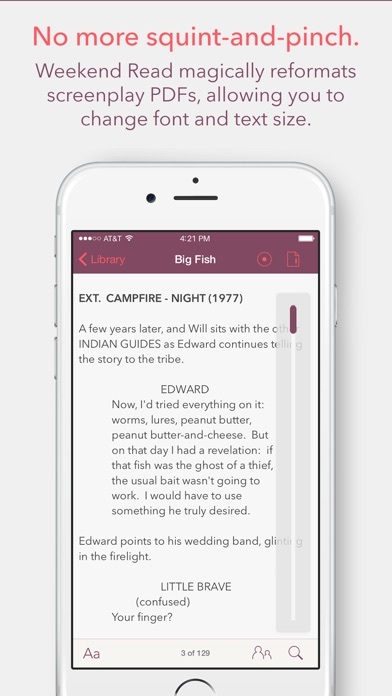 Weekend Read makes reading screenplays on the iPhone delightful, giving users an optimized view that takes best advantage of your retina screen. 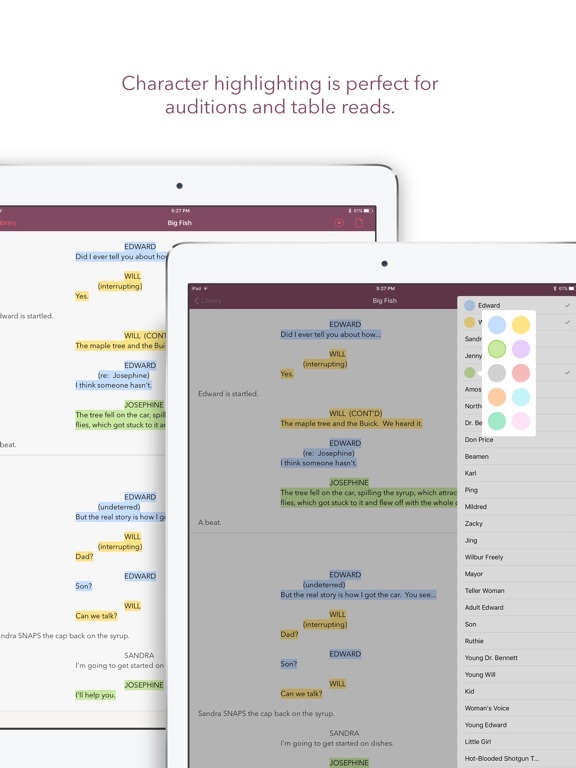 You'll never squint-and-pinch to read a script again. 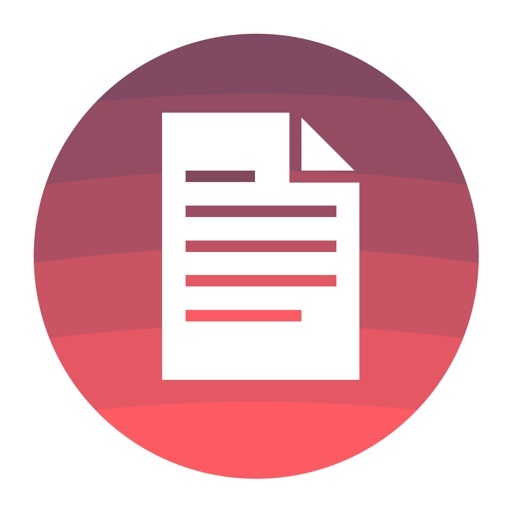 Whether you're starting with a PDF or a native file like Final Draft or Fountain, Weekend Read makes it look great, with a choice of fonts, sizes and Dark Mode for night reading. Created by screenwriter John August and the team behind the award-winning Highland, Weekend Read has Hollywood talking. "With Weekend Read, John August and his crafty elves have taken something that was the worst thing, namely reading scripts on a mobile device, and turned it into the best thing. I find it more pleasant to read a script in Weekend Read on my 4-inch iPhone screen than to read a PDF in proper screenplay format on my iPad. I even prefer it to reading full-sized paper scripts." 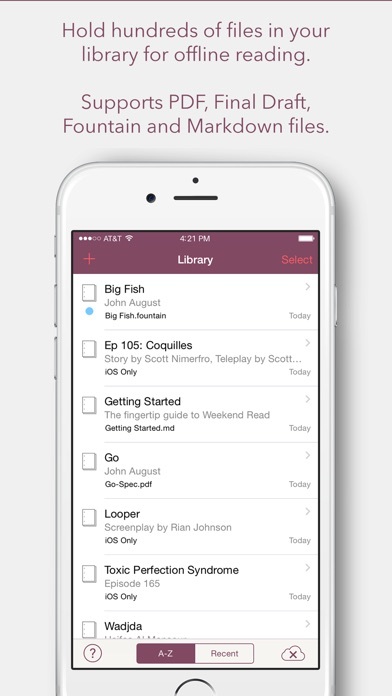 "Weekend Read started as an app I didn't know I needed, and quickly became an app I can't live without. 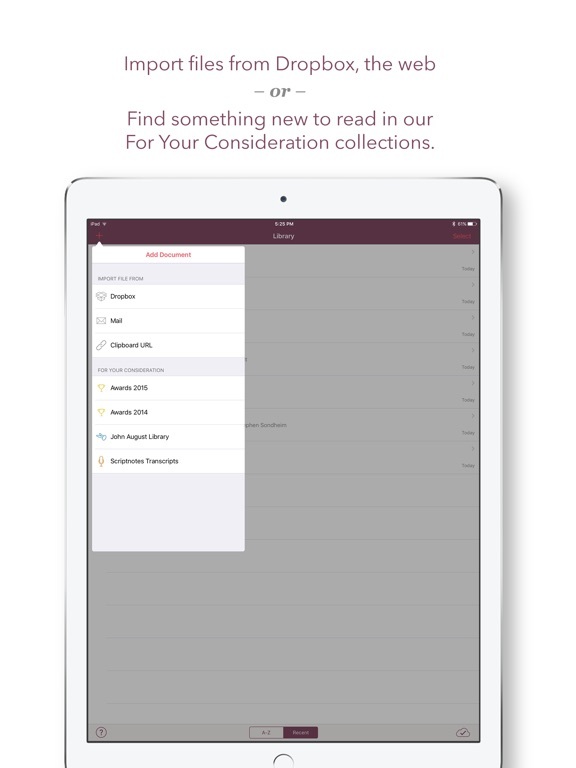 Weekend Read keeps you on top of your reading pile, not buried under it. It's seriously amazing." 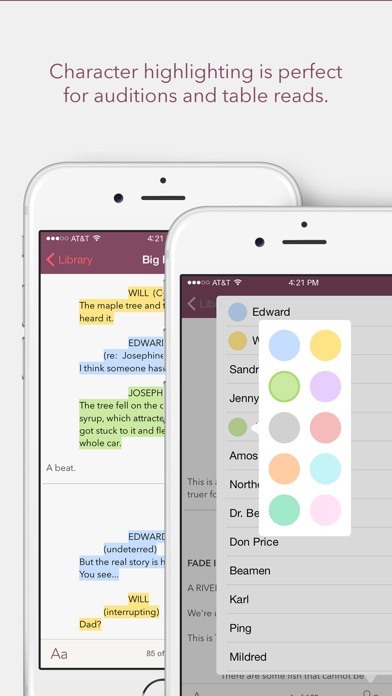 "This is the perfect solution I've been fantasizing about - it makes reading scripts (or anything) on the iPhone not just tolerable, not just painless, but actually a pleasure!" 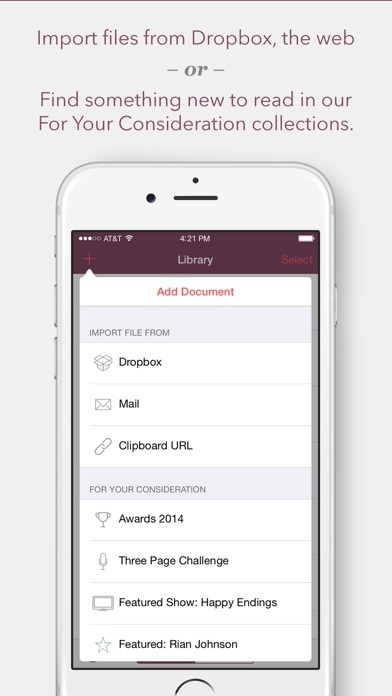 Weekend Read also supports text and Markdown files, making it a perfect offline reference for notes. 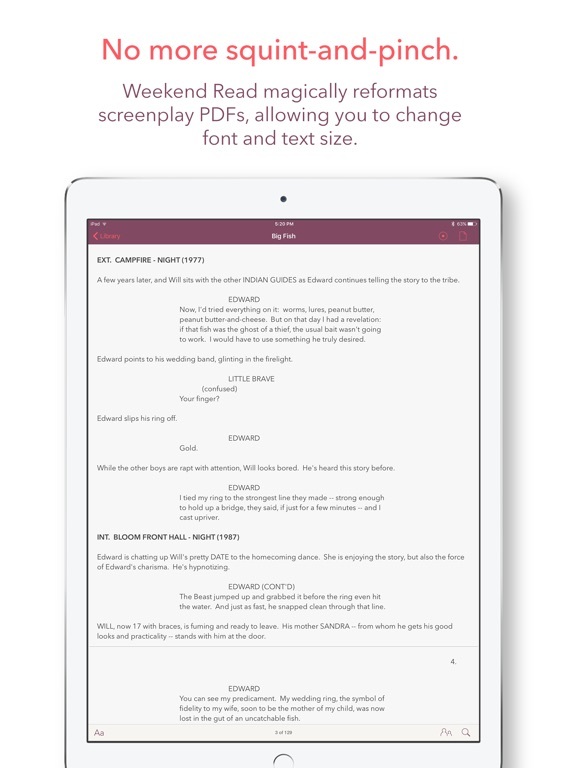 Weekend Read makes reading screenplays on the iPhone delightful, giving users an optimized view that takes best advantage of your retina screen. 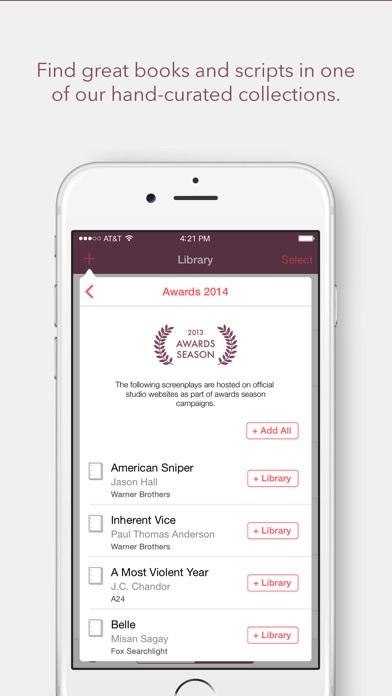 You’ll never squint-and-pinch to read a script again.